If you are like me, you probably don’t remember, but back in 2017 Arm announced the Platform Security Architecture (PSA) that defines a set of requirements to secure low cost Internet of Things devices. 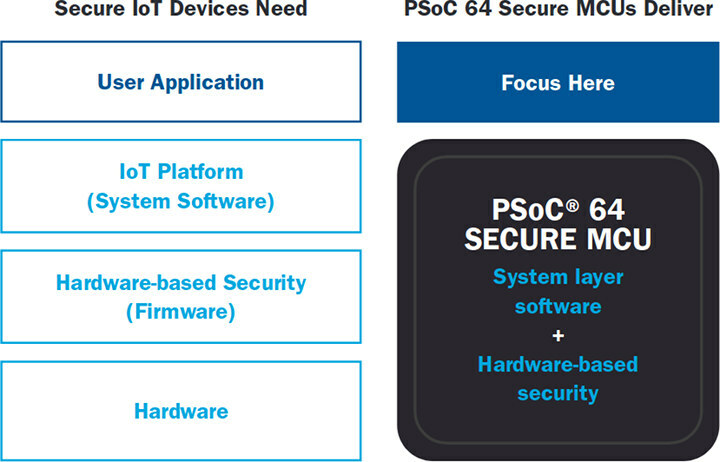 There’s now at least on PSA compliant microcontroller, as Cypress Semiconductor introduced their PSoC 64 Secure MCU at Embedded World 2019 last month. The press release claims that PSoC 64 MCU family is one of “the first Arm Cortex-M processors to be certified as Level 1 compliant within the Arm Platform Security Architecture (PSA) certification scheme, PSA Certified, utilizing a secure Trusted Firmware-M (TF-M) implementation integrated into the Arm Mbed OS open-source embedded operating system”. PSoC 64 Premium with Standard model features, but a Cortex-M0+ core allowing the developer to add his/her own trusted applications. Beside hardware based security implemented in the firmware, Cypress Semiconductor also provides an IoT Platform with RTOS, WiFi, Bluetooth (Classic/LE/Mesh), MQTT, TLS, a Cloud application agent, a data collection agent, and more, which are all available from the company’s ModusToolbox Software Environment. PSoC 64 secure MCUs can interface with popular cloud services such as Amazon Web Services (AWS), Arm Pelion and Alibaba. Cypress’ PSoC 64 Secure MCUs with SecureBoot will be sampling in Q1 2019, with other variations planned for Q2 2019. You may find a few more details in PSoC 6 product page, as well as in a brochure specific to PSoC 64 microcontrollers.